Portsmouth are facing a fine from the Football Association after a number of incidents involving smoke bombs. Tuesday's game against Newport was interrupted after two smoke bombs were thrown onto the pitch at Rodney Parade. The club confirmed the FA is investigating a number of incidents involving a tiny section of supporters. In a statement the club asked "fans to be vigilant and if they suspect or see such behaviour or devices being used, they should immediately report it". The club added: "Any supporter who is proven to be involved in any such incidents will face potential prosecution and a substantial ban from attending matches both away and at Fratton Park." 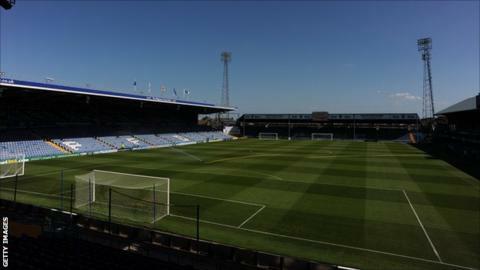 With the prospect of a fine looming over the fan-owned club, the Pompey Supporters' Trust have criticised the people responsible saying any punishment could prevent manager Guy Whittingham from signing any future players. "The name of Portsmouth Football Club, the biggest fan-owned club in the country, was shamed at Newport," said a Trust statement. "I'm not referring to the performance on the pitch - the least said the better on that - but by the thoughtless idiots that smuggled in a couple of smoke bombs. "Imagine the scenario, Guy wants to bring in a couple of loanees for a month, 'sorry can't do that, we've just paid out £10k because someone threw a smoke-bomb'. "I've seen the money come in to the Trust to help us buy this club. I've seen where it has come from. "It has come from right across the spectrum of our community, not just those in decent jobs but from schoolchildren, students, the unemployed, pensioners. They wouldn't want to see it go up in smoke."